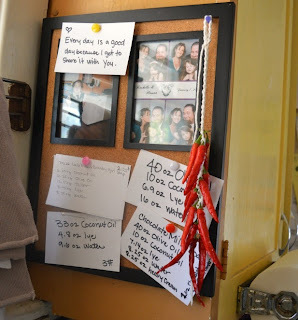 When I was a little girl one of my aunts had a southwest themed house, including a large chili pepper ristra decoration in the kitchen. It was definitely a don't-touch item, but it was cool to look at. I think my mom had a garlic braid in our kitchen in my childhood too, but I don't remember her cooking with it. I think food decorations must have been big in the '80s. There's probably an entire landfill devoted to those decorative bottles of infused pepper oils... LOL!!! Um, for those of you who don't know what a ristra is, it's a hanging arrangement of chili peppers (usually tied with raffia) and it's both decorative and functional. It's a way of drying and displaying the peppers. It's handy to have the dried peppers hanging on the wall, because you can just pull them off and crush them up and into your spaghetti sauce or taco meat. As I mentioned in my last post, I've got a few pepper plants that are just going wild in the summer heat. One of my plants is a chili pepper that I can't pick fast enough. I was drying the peppers in a basket on the kitchen counter, but since counter space is at a premium around here, I had to think of a better way to dry them. Suddenly, I remembered my aunt's chili pepper ristra and I knew I could make one for my peppers. I'm going to call this a helpful tip, because it's too simple to be a pattern. I grabbed a size G crochet hook, and some cream colored cotton yarn, and I made a chain about ten inches long. I made a slip stitch in the 8th ch from hook, and fastened it off. Then I took my peppers and wove the little stems in between the chain stitches. The peppers are lightweight, and the stems are a little jagged/pokey so they stuck right into the yarn and hung there! I've still got plenty of room for more peppers as they come off my plant. Even if I fill the whole thing, it'll take me about two minutes to make a second one, including looking for where my crochet hook has rolled off to. LOL!! I think it looks great in my kitchen, although I am very much looking forward to those bottom peppers drying so that I can cook with them! I'm sure I'm not the first person to have thought of this, but I'm feeling terribly clever today... :D I hope you guys all have wonderfully clever days too!! Hi There,Mmmmm!!!Handy!! !LOL about the landfill!! !Probably very true!! !Have a great weekend!! !